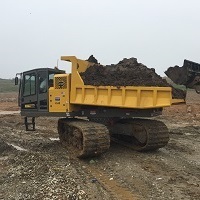 Terramac is a leading manufacturer of rubber tracked crawler carriers offering a variety of models which include: 360° rotating RT14R, rugged RT14, mid-sized RT9, and nimble RT6. Exerting minimal ground pressure makes units ideal for hauling soil for the daily cap. When combined with a spraying applicator the units are perfect for applying alternative daily cover slurry. Terramac carriers are supported by a full line dealer network delivering localized sales, parts, service and support. The Terramac RT14R rotating crawler carrier is designed for all-terrain, heavy duty material hauling with increased efficiency and enhanced operator safety. The carrier boasts a 28,000-lb. carrying capacity for hauling daily cover on landfills, and is built with a rugged 360-degree rotating upper frame to offload materials at any angle or on the go. The rotation on the RT14R ensures operators maintain a face forward position and creates less track wear, resulting in reduced downtime and repair expenses for landfill management contractors.